OK so you’ve gotten your big seed order in the mail, now what? What do you use to actually start the seeds in? What kind of pots? What kind of soil? After deciding what seeds to order you need to know what medium to plant your future garden in. 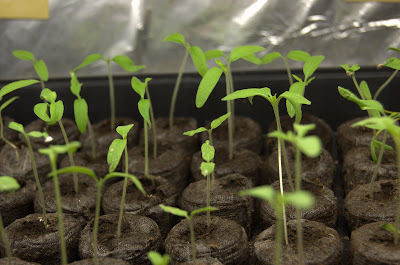 There are a lot of variables out there to choose from, let’s take a look at a few options for starting your seeds for this Seed Sowing 101 post! First of all there are some basic simple soils you can use to put your seeds into that will work fine. Generally they consist of a combination of a few ingredients peat or coir for the bulk of it, perlite or vermiculite to add drainage and lighten the soil a bit, and maybe some sand to improve the drainage. Peat has been the tried and true main seed starting soil ingredient for years but coir is catching on fast. Coir is made from the waste hulls of coconuts while peat grows naturally and slowly in peat bogs. There is some concern today about the sustainability of peat which is why many gardeners are leaning in favor of coconut coir. Either will work fine. Both vermiculite and perlite are light materials that improve the drainage of soils but there is a major difference for the gardener be aware of. Vermiculite added to soil works great to improve the drainage but there is an issue with some vermiculite containing asbestos. Asbestos isn’t a good thing! I prefer perlite which is made from heated volcanic glass that resembles styrofoam bits and pieces. You’ve probably seen it before and wondered “why in the world did they put styrofoam in my potting mix?” Well they didn’t! You can go out and buy a commercial seed starting mix (which I’ve done many times) or you can make your own. Generally it is cheaper to buy the raw ingredients and put together your own special blend. It also gives you a great amount of control over what kind of plants you’re starting. For something that needs better drainage and lighter soil you would just put in a higher ratio of perlite to the mix. You can even add in other ingredients like compost to create your own seed starting mix. There is some evidence that completely composted compost (say that 5 times real fast!) has a positive effect against damping off! So consider the compost! You could also buy the store bought seed starting mixes and add a little of your sifted and full decomposed compost from your compost bins. I’m convinced compost will save the world one day! If you’re short on time or lack of experience is a concern then there is nothing wrong with purchasing a ready to grow seed mix. Because these mixes do not contain many ingredients that will offer nutrition to the plants you may need to add some light fertilizer after the seeds have germinated. (Please steer clear of synthetic fertilizers if at all possible!) Keep fertilization light at this point because you don’t want too much green growth until a good root system is established. 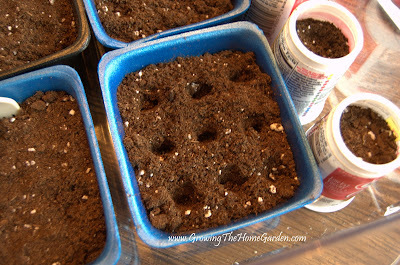 I have used the peat pellets in the past and found them to be very easy for starting seeds. The pellets, which resemble small dried disks, need moistened before seed starting. Once the pellets been sufficiently moistened they expand into small cylinders of soil where you can plant your seeds. I like the fact that you can plant these directly into the garden when the plants are strong enough or you can move the seedlings into larger pots without having to change pots around. I highly recommend using a biodegradable pots for your seeds. Peat pots work great but there are other options. Coir pots are catching on as are a unique product made from the waste of the dairy industry – Cowpots! Cow pots take the composted manure and form it into pots that will actually provide nutrition to the soil. I reviewed some cowpots last year and found them to be a pretty nice option. The only downside is a little odor when wet – you wouldn’t want them in the kitchen windowsill I think ;). The odor is just one small negative when compared with a renewable resources that does an excellent job at growing plants. Of course another excellent option for seed starting pots are the flats from all those plants you purchased last year! 6 packs work great if they are in good condition (they break down and tear easily) but I really like the idea of using a flat. After you add soil to the flat and add enough water to dampen it you can plant it in mini-rows then transplant the young plants once they have their first set of true leaves. Or scatter sow in the flat! There are two awesome advantages to using a flat, one is that all the plants are in a single container and when the seedling flat needs moved there is only one container to deal with for all the seeds. The other advantage is that when some seeds fail to germinate (which happens all the time) a whole container hasn’t been wasted! Avoid sowing different types of seeds in the same container or flat as that is a recipe for confusion! Mushroom containers make great seed starting flats! I’ve often used yogurt containers, mushroom containers and all sorts of plastic containers destined for the recycling bin to start seeds in so use your imagination when coming up with a container! Just be sure to thoroughly clean out any containers that have been used before to reduce the chances of a pathogen hurting your seedlings. (A 10% bleach 90% water solution will do the trick). A lot of people have success using newspapers wrapped into a pot form or even cardboard tubes left over from toilet paper and paper towels. There are many, many options for seed starting pots! The next topic for Seed Sowing 101 will be all about timing! Timing is everything right? Or so they say! Thanks for following along and if you’ve found this helpful please share it with your friends! Dave, I have had good luck starting seeds in flats with a seed starting mix. I then put the plastic tops over them until they germinate. It is a pain to keep thining but it avoids having to put them in separate pots. I definitely agree! Much better to take a few minutes to separate seedlings than to waste a pot if it isn't needed! I have used peat pot many times, and I really like the idea that you can plant them right into the ground. I share your concern about vermiculite and never use it. Do you ever put some soil from your gardens into your seed starting mix?